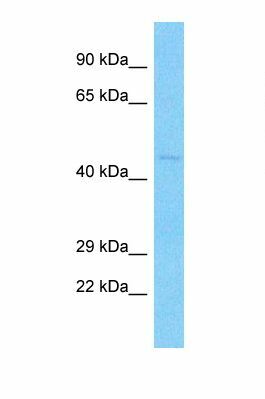 5-HT1E Receptor antibody LS-C425973 is a biotin-conjugated rabbit polyclonal antibody to 5-HT1E Receptor (HTR1E) from human and chimpanzee. Validated for WB. Synthetic peptide from N-Terminus of human HTR1E (P28566, NP_000856). Percent identity by BLAST analysis: Human, Chimpanzee (100%). Western blot of Human A549. HTR1E antibody dilution 3.0 ug/ml. This image was taken for the unconjugated form of this product. Other forms have not been tested.